In their final programme of the year The Royal Ballet celebrates Sir Frederick Ashton, the founder choreographer who gave this company a wonderful classical repertory and British ballet a defining style. Initially I thought of this double bill as a case of odd pairing since, on one corner, appealing to the Ashton addicts and older crowds, there’s the very chic Les Patineurs, and on the other, practically screaming “kids only”, the Tales of Beatrix Potter. Why match them? Mr. Clement Crisp, the eminent Financial Times dance critic, has a strong opinion on Potter: “My reaction is to remind myself that the right place for a piglet is a roasting-dish, that squirrels are vermin and that mouse-traps are cheap”. But we must try to practice what we preach and approach ballets with an open mind. Having seen neither piece before, off I went looking forward to a feast of Ashtonian body bends and patterns. Featuring a créme de la créme opening night cast I thought Les Patineurs was a ballet of sheer beauty. Ashton conjures a vintage ice rink and through the way the dancers move and the various divertissements we get glimpses of couples, groups and individuals, all having a jolly good time skating. 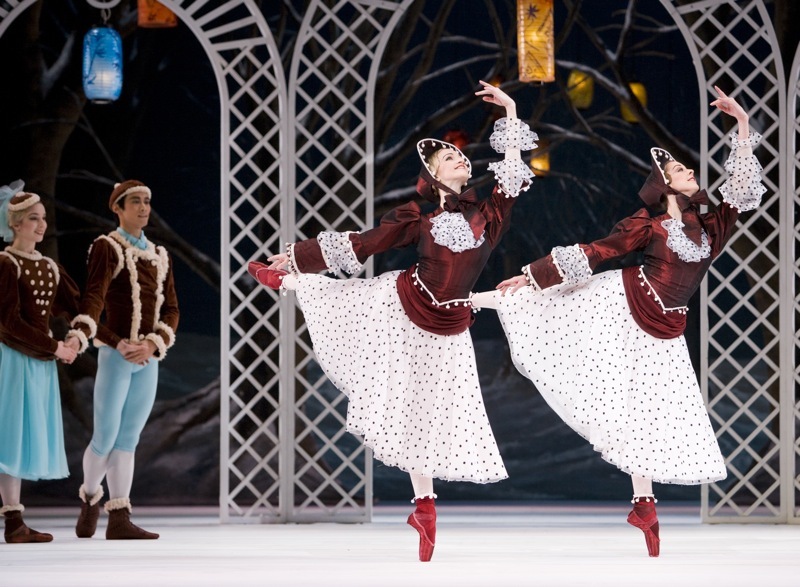 To replicate the feel of dancing on ice the chassé is heavily used, as are fouettés and various forms of spinning and walking on pointe. Soloists emerge from the group dances, developing their own signature moves on ice, with blue girl Laura Morera giving a masterclass on the suppleness of the Ashtonian back and fellow blue skater Yuhui Choe combining quick footsteps with the most graceful upper body and showing off some amazing fouettés en tournant. The central white couple was handsomely danced by Sarah Lamb and Rupert Pennefather. This pas de deux is such an elegant portrait of a couple in love, beautiful dance emanating from the simplest of stories, so truly and deeply Ashton. But the evening’s scene stealer is Steven McRae as the Blue Boy, a role that seemed created on him as it demands a combination of panache and precision, both of which he is able to deliver by the bucketload. Delighted, poised and completely in character as the ice-rink show-off he dazzled the house in series of sparkling beaten brisés and a jaw-dropping combination of turns on fourth gear. Next item on the bill, the parade of cute furry animals in Tales of Beatrix Potter, with their nostalgic, just-fresh-off-the-books manner, might have won over quite a few cynics in the audience. 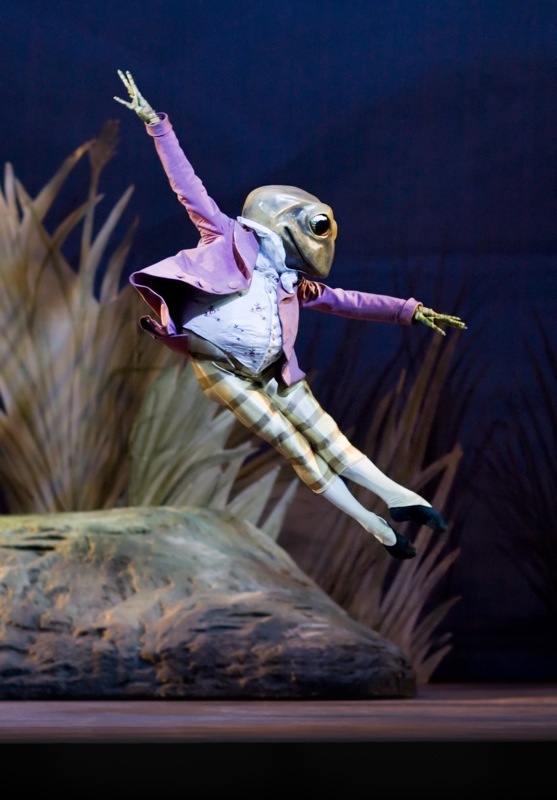 As a dance piece it might not be very complex, but consider this: every character onstage is dressed in a bulky costume weighing between 4 and 5 kilos, with the animals heads an extra 2 kilos (our thanks to Bennet Gartside – aka Bennet76 – for this interesting bit of Potter trivia). The fact that they can dance any steps at all baffles us, with the quick and imaginative footwork for Squirrel Nutkin (Paul Kay) and Mr. Jeremy Fisher (Kenta Kura), the underlying elegance of the pas de deux between Pigling Bland (Bennet Gartside) and Pig-Wig (Laura Morera), the quirky pantomime between Mrs. Tiggy-Winkle (Jonathan Howells) and the Fox (Gary Avis) seeming like a miracle. There were, of course, plenty of kids amongst us but I could just as well see several adults gasping and smiling while Hunca Munca and Tom Thumb smashed the plates from the doll house. And so, by unleashing our inner kid and opening a window to a simpler past where the biggest problem was finishing homework before a good bedtime story, Potter weaves its Christmas magic. It worked on us. 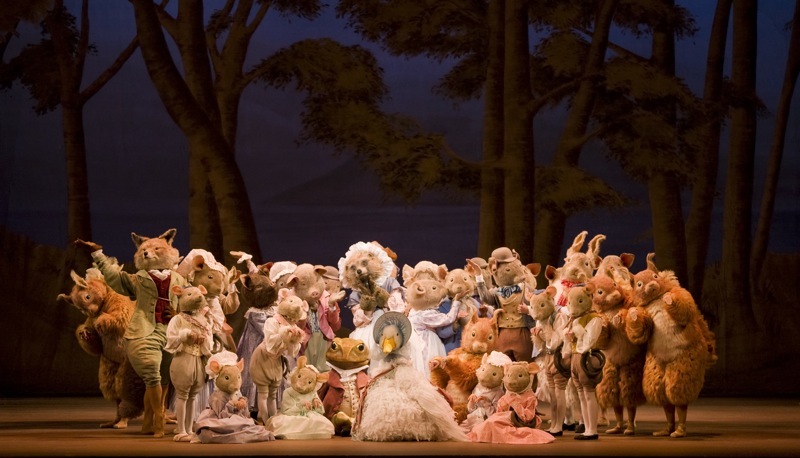 Ashton’s Les Patineurs and Tales of Beatrix Potter will be at the Royal Opera House until December 31. For booking details visit the ROH website. Christmas season is definitely upon London, with decorative lights on the streets, people rushing to buy presents, chilly mornings and, ballet-wise, the possibility of finishing off the day with The Royal Ballet’s Nutcracker now in its 25th season. 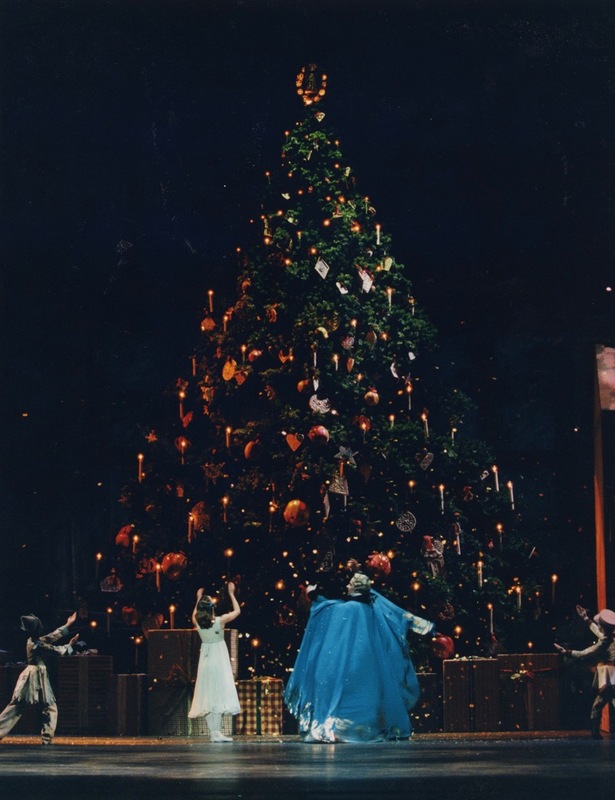 Sir Peter Wright’s staging sticks to the original Hoffmann story where Drosselmeyer’s nephew Hans-Peter has been cursed and turned into a Nutcracker doll by the revengeful Mouse King. The spell can only be broken if he defeats the royal rodent while also capturing a young girl’s heart. Drosselmeyer sees in the Stahlbaum’s daughter Clara the potential to be just that girl. Given the heartwarming plot this Nutcracker could easily slip up into kid-friendly Disney territory but, thanks to the dark German Romantic undertones, it also scores with grown ups. Act I takes place at the Stahlbaum home where guests and family are gathered for a Christmas party. Drosselmeyer (a spot-on Will Tuckett) arrives with his deep turquoise cape, gadgets and plenty of magic tricks including giant dancing dolls and the gift of a Nutcracker doll for Clara. Blink and you will miss lovely details such as Gary Avis‘s very funny rheumatic Captain trying to prove “he’s still got it” in the elders dance and the Marzipan cake which will become the sugar-coated stage for the Act II divertissements. The only letdown here is Drosselmeyer’s mending of the Nutcracker doll after it is broken by Clara’s brother as he seems to repair it manually instead of magically as one would expect. In her debut as Clara, Leanne Cope captures all the freshness of a teenager and her wonder at the supernatural events which unfold before her eyes. Her dancing too was charming despite a couple of early mishaps, presumably due to a slippery floor at the Stahlbaum home. Paul Kay showed beautiful lines and crisp dancing as Hans-Peter, with plenty of energy in the battle with the Mouse King. In Act II the Stahlbaum home and the Land of Snow give way to the Land of Sweets (Comfiturembourg). Here the often disconnected sequence of divertissements is cleverly linked to the story with the full participation of Clara and Hans-Peter and a mime scene where they explain their battle with the Mouse King to their hosts Prince Coqueluche and The Sugar Plum Fairy (Steven McRae and Roberta Marquez). Steven has been filled with praise on opening night and deservedly so. Not only does he ace his variation, he also shows regal poise and gentlemanlike manners, taking a step back to let his ballerina shine. Roberta Marquez only keeps getting better (the McRae effect?). Her Sugar Plum Fairy is lovely and even if the tricky gargouillades do not yet fully come through she compensates with phrasing, accentuating gestures such as her delight at meeting her partner, full of rapport with McRae in the pas de deux. Here, both Roberta and Steven give us more than is arguably needed from a short role that calls for no more than solid technique and a beautiful display of line, where all the emotional punch is already contained in Tchaikovsky’s score. Elsewhere, Yuhui Choe was the most beautiful Rose Fairy and her escorts, led by Brian Maloney and Johannes Stepanek were flawless, the Russian dance with Ludovic Ondiviela and Kevin Emerton another highlight. The closing sequence has Clara back in the real world wondering whether it was all just a dream. Soon a chance meeting with Hans-Peter on the street where she lives suggests quite the contrary. And while the final reunion between Drosselmeyer and Hans-Peter might bring a tear to one’s eye, once the curtain is down over wintry Nuremberg the audience is all smiles. Let Herr Drosselmeyer keep fulfilling his purpose for many years to come. Triple bills are a great opportunity to discover rarer ballets along with new works, an essential ingredient in preserving the future of this art form. The Royal Ballet’s latest features a modern and sizzling combination well suited to those seeking refuge from an evening of tutus and tiaras. It opens with Agon, Balanchine’s iconic work in collaboration with Stravinsky and follows with Glen Tetley’s Sphinx, originally created for American Ballet Theatre (ABT) and newly acquired for the company. The bill closes with Wayne McGregor‘s new ballet, Limen, successor to his previous works Chroma and Infra. Even if modern is not your thing, the genius concept behind Agon merits a visit. Balanchine built it from the interplay between 12 dancers and combinations of patterns and shapes. It demands pristine technique and inherent musicality to sustain the choreography. The steps are akin to those every dancer executes in class but here they do so with a twist (e.g. exaggerated arabesques) and at an incredibly fast tempo. It is always interesting to see the Royal Ballet tackle this type of abstract work because of their dramatic tradition and natural bond with the Ashton and MacMillan repertory. In their hands Agon goes beyond the exploration of movement and amalgamation with music (or its realisation in choreographical terms) and you sense at times they are trying to convey a string of short episodes. The first cast includes up-and-coming soloists (Yuhui Choe, Hikaru Kobayashi and Brian Maloney) alongside established principals Carlos Acosta and Johan Kobborg and rising star Melissa Hamilton, fresh from her MacMillan debut as Mary Vetsera last week. The leading men (Acosta and Kobborg, plus Valeri Hristov and Brian Maloney) make Agon’s tricky footwork sequences and off-centred positions look easy, though Daniel Capps‘s conducting seemed to be going against them towards the finale. The ladies were led by Mara Galeazzi, a charmer in the Bransle Gay and by Melissa Hamilton, in the pas de deux with Acosta. 21 year-old Melissa seemed entirely at home in the intricacies of the pas de deux, sinking into a penché so deep that her nose touched the knee as if it were no trouble at all. It was inspiring to see her unique blend of suppleness and elegance contrasting the earthy quality of Acosta’s partnering. Tetley’s Sphinx fits the company and this particular cast of dancers as snugly as their bodysuits. It must be quite a challenge to balance Tetley’s high-powered choreography with the characterization of each role but Edward Watson‘s acid orange Anubis dazzles and threatens with swirling diagonals while Rupert Pennefather, looking every inch the greek hero, partners solidly. The heart of the ballet comes in the shape of Marianela Nuñez as the Sphinx who risks her life in exchange for a promise of love, and who is ultimately betrayed. She initially appears dominant and powerful, with arms that recalled an elegant bird of prey, but after she whispers the answer to her own riddle to Pennefather’s Oedipus she changes into a hopeless, defeated creature who now embraces mortality. Sphinx might not be everyone’s cup of tea (its costumes and designs look more Studio 54 than ballet) and those not familiar with Jean Cocteau’s take on Oedipus will be left scratching their heads. We like it, not only for the literary souces, but for its athleticism and this particular cast’s foolhardiness in performing this exhausting piece brilliantly in three consecutive days. McGregor’s Limen is centred around the themes of life and death, light and darkness and the thresholds in-between, to align with Kaija Saariaho‘s cello concerto “Notes of Light”. Again McGregor taps strongly into technology, via Tatsuo Miyajima‘s designs and amazing lighting by Lucy Carter, to set the mood for the various movements in the music. Limen features a cast of 15 dancers, including many of his regulars. The choreography stays true to McGregor’s trademark quick movements, contortions and extensions, although since Chroma he has been progressively softening his edgy dance language. There are also nods to previous ballets Agon and Sphinx (e.g. the iconic Agon attitude wrapping the man and the pirouettes with arms à la Sphinx) and, as such, Limen might be McGregor’s own version of a Balanchine ballet: what we are seeing really is a representation of the music and its subliminal message of light against darkness. Limen opens with a translucent curtain in which numbers are projected, representing the passage of time. The cello’s voice cues in the orchestra and behind the curtain we see Edward Watson mirroring the music and slowly moving through extensions while new dancers start to emerge to match the remaining instruments. The second movement is led by Steven McRae and an ensemble of dancers, who become “alive” as they enter a colourful square of light. The orchestra takes over and energetically fights the cello, serving as a backdrop for McRae’s remarkable solo, which combines McGregor’s language with classical vocabulary. Classical dance fully inhabits the third and fourth movements and their lyrical pas de deux. Marianela Nuñez and Brian Maloney echo the brief harmonious dialogue between the cello and the orchestra, while Sarah Lamb and Eric Underwood represent Saariaho’s cello eclipse. As Underwood embraces and lifts Sarah, she folds her body in every possible way (with the costumes and dark lighting enhancing the effect) to the fading sound of the instrument. The final movement is a return to the light, symbolised by a panel of blue LED lights which loom over the dancers now dressed in flesh coloured leotards. Watson carries the emotional baggage of the movement, once more showing his wonderful use of extension. The ballet (or is it the music) ends with a question, as the cello sings its last note (a very high F sharp): have we reached the heart of light or are we back into darkness? The dancers face the back of the stage and the lights dim, Watson the only dancer who stands at a threshold between this ensemble and the front of the stage. Once again McGregor has delivered a keeper, perhaps even a natural conclusion to the trilogy that started with Chroma (Chroma is the absence from white, while Limen might be the absence of colour). It has become clear that he is now more comfortable with classical vocabulary and could be interesting to see what choreographic surprises he might throw at us from now on. We can’t wait. When the Mariinsky brought their Soviet Beauty to London this summer I left wishing I could have seen their lovely Aurora Evgenia Obraztsova in a more agreeable production. I think the Lilac Fairy must have heard my wishes, for they came true last Saturday: Evgenia was back in London guesting in The Royal Ballet’s Sleeping Beauty. Having originally planned to see only 2 performances of the ballet this time, both featuring these Bag Ladies’ favourite Aurora Alina Cojocaru, I suddenly had to make room for more. After all, when a Mariinsky ballerina (and another notable Princess Aurora) descends upon your local company you drop all prior engagements and spend your emergency ballet cash on whatever seats are left. And there weren’t many. Evgenia, who had just made an important debut a few days before as the Tsar Maiden in Ratmansky’s version of The Little Humpacked Horse, is an utterly charming Aurora and the Royal Ballet’s very delicate production of this classic fits her like a glove. She did not seem to have any issues with the differences in the choreography, nor with the slower conducting tempo which actually did her a great service during the Rose Adagio‘s trickier passages. Obraztsova makes her Act 1 entrance reminding us that none of the qualities bestowed on the 16-year old Princess by the fairy godmothers are wasted on her. During Aurora’s variation she even nods to the often overlooked Fairy of the Song Bird with an exquisite flutter of her hands, showing how important it is to truly have the gift of musicality when you dance a role like this. In the Rose Adagio she responds to her suitors with equal doses of shyness and coquettishness and even though she dared not look at them during the first series of balances, she risked one or two flirty glances as soon as she had settled into the final promenades. This might be unconsciously done but it fits the character of a teenager still not used to all that male attention so well. She also had a good rapport with her prince David Makhateli. 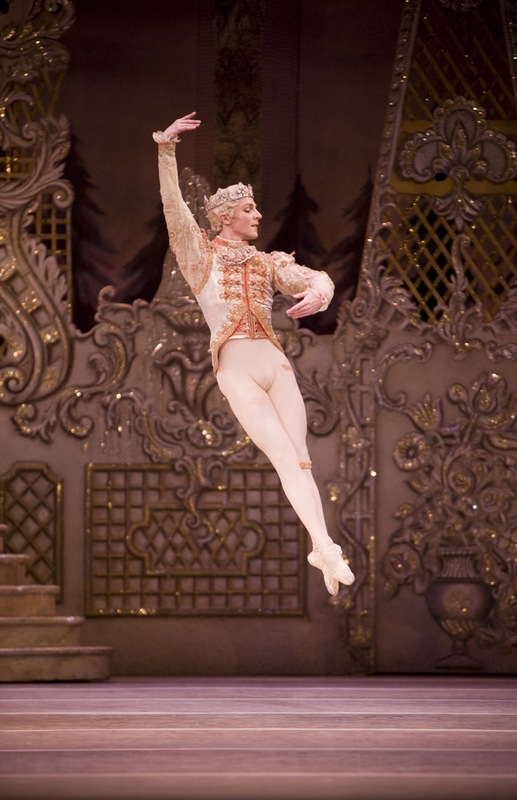 David, a dancer who possesses a vintage aura of Romanticism, is perfect for the role of Prince Florimund. He is elegant and very fine in the adagio parts and in his display of classical line. While their first pas de deux in the vision scene conveyed mutual longing, in the wedding pas de deux we have a real sense of two souls united from the way they slowly mirror each other’s steps and then converge into one. A detail I admire about David’s Florimund is that he does the “no hands fish dive” finale looking lovingly at his Aurora whereas most Princes tend to gaze at the audience. But how could he not, with such an exquisite dancer as Evgenia in his hands? This being a matinée it was normal to expect certain roles cast at a more junior level. It was a pleasure to see the elegant Xander Parish as the Lilac cavalier and corps member Akane Takada so confident in soloist roles. She gave a good injection of fluidity to the tricky Fairy of the Enchanted Garden variation and continued to shine later alongside the always delightful Yuhui Choe in the Florestan Pas de Trois. Kristen McNally was a very wicked Carabosse. But one still laments the fact that, save for Marianela Nuñez, the company seems short of Principal dancers who can tackle the fiendish role of the Lilac Fairy. As lovely as Laura McCulloch is in manner and in mime, the Lilac’s prologue variation, with its Italian fouettés and turns that demand Swiss-watch precision, is too big a challenge to be cast at anything other than Principal level, even in a matinée performance. The 2008/2009 Royal Ballet season was filled with golden tickets, but which acts made the Bag Ladies tick the most? As we gear up to restock for the new season (tickets go on public sale in 2 weeks), see our top dancers & top dances below and feel free to use the comment form to opine on who was just the ticket for you! Melissa Hamilton and Eric Underwood in Infra. Photo:Laurie Lewis - Royal Ballet ©. Source: The Independent. She was a golden vision in her first big role, stepping in for (and looking remarkably like) Sarah Lamb on L’Invitation au Voyage, but Melissa soon made a mark of her own in a selection of modern pieces like McGregor’s Infra, Acis & Galatea, Wheeldon’s DGV and Marriott’s Sensorium, making the most of her edgy line and incredible extensions. Injury may have robbed him of touring last summer & of some chunky debuts (including Lescaut in Manon) but McRae returned to the stage just in time to sparkle in The Nutcracker, shine as the Golden Idol, create principal roles in McGregor’s sleek productions of Dido & Aeneas/Acis & Galatea and bag a promotion to Principal, no mean feat! (For a full feature on Steven, see our previous post). Alina was sorely missed at Covent Garden for over a year, which was more or less the time it took her to undergo & recover from neck surgery. But in April she returned triumphantly in one of her signature roles, Giselle, amongst a shower of daffodils for the ages. She also managed to play her quirky side in the sweet & short Les Lutins, glow like the most brilliant jewel in Diamonds and join the RB summer tour for the first time since 2006. Alina Cojocaru and Johan Kobborg in Giselle. Photo: Tristram Kenton ©. Source: The Guardian. From his intense and deep reading of Des Grieux and the teacher in The Lesson to his display of virtuosity in classical roles such as Solor, Siegfried and Albrecht, Johan keeps showing us he still has it at 37. We may have missed his partnership with Alina, but at least there was that one Giselle. His future as a choreographer looks promising, given that he got stellar reviews on his short work for the Linbury, Les Lutins. Intensely beautiful in Ondine, beautifully intense in Isadora, lush in Manon, luxe in Emeralds, Tamara squeezed dramatic juice in every role she was cast and brought home two DVDs (soon to be released “La Bayadère” and “Manon”, both with Carlos Acosta) to add to her Romeo and Juliet which is rumoured to be “on its way”. We knew we could expect great things from Polunin, after that taste of his Golden Idol last season. With outstanding debuts in Tetley’s Voluntaries, as Solor and in the Nutcracker, he spent all season stealing the thunder from more established colleagues. The reward was a deserved promotion to First Soloist, and a main feature in the ROH media campaign for the upcoming season. All of this at 19! A great season for Marianela, with lots of opportunitities to display her pristine technique and to bag big roles such as Giselle. Her “4 great Swan Lakes in 7 days” deserves a wizardry award of its own, but on top of that, she gave stellar performances in abstract pieces, from which we definitely remember Voluntaries, Serenade and that Pas de Deux in Infra. Yes, we know that this category seems lifted from the 2008 Dancing Times Award where both Ed and Yuhui (see below) won accolades but Watson was truly a “man for all seasons”, dancing in 13 out of 24 ballets (the busiest principal of all) and leaving a mark of diversity both in the quality of his dancing & repertoire, which spanned from old classics (Giselle, Firebird, Ondine) to the 20th century classics (Manon, Dances at a Gathering) and the contemporary (Infra, Acis & Galatea, DGV). Injuries for some, opportunities for others. Added to scheduled debuts as the Sugar Plum Fairy and Nikiya, Yuhui also made the most of whatever chances she got to cover for her seniors, displaying her ethereal dancing, strong musicality, those trademark soft arms (Dances At a Gathering, Les Sylphides), coupled with energy & attack (The Lesson, Rubies). Carlos Acosta and Alexandra Ansanelli in Rubies. Photo: Johan Persson- Royal Ballet ©. Copyright belongs to its respective owners. Fair enough, Alexandra and Carlos were never really a partnership (they had a brief stint in La Bayadère, back in January) but the sizzling chemistry they displayed in Rubies, in roles which were so in tune with their own abilities, made us wish, first that Alexandra would have been cast to dance with Carlos in Dances at a Gathering back in March and second, for a world in which Alexandra was not retiring, so we could see them paired again. Easily the best couple in Jewels, it was clear that Carlos found his match in Alexandra’s flirty and bendy ruby. The Royal Ballet has productions of the classics that either go over the top of glittery & sweet or fall short when compared to its counterparts in other big companies, but Giselle truly deserves being nicknamed as “The Jewel in the RB’s Crown”. Sir Peter Wright‘s production brings the story to life with beautiful designs, costumes and most importantly, coherent storytelling through both the mime and choreographic sequences. DAAG really is like Mr. B said to Mr. Robbins: like popping peanuts in one’s mouth. The combination of the Chopin piano pieces, the delightful choreography and the RB’s unique imprint is so addictive we could watch it over and over again. Please cast your vote on our Facebook page (link to the poll), or let us know who you think deserves the accolade. RB’s Alexandra Ansanelli , RB’s Isabel McMeekan, PNB’s Louise Nadeau, SFB’s Tina LeBlanc. It is hard to believe that someone like Alexandra Ansanelli, one of the Royal Ballet’s youngest principal ballerinas, is retiring, given all her accomplishments and the fact that she has always been so vocal about her passion for dancing. At only 28, her impressive CV includes principal dancing jobs in two of the world’s foremost ballet companies and a list of personal achievements which range from overcoming major obstacles and injuries, to adapting to different styles and winning over demanding dance audiences with her particular gifts. The Ballet Bag is sad that Alexandra is leaving. Over the last two seasons she had become a staple at Covent Garden, someone clearly distinctive, elegant and with particular subtleties in her dance. We also admired her courage of facing up to skepticism and how she adapted her training and brought her unique gifts to the Royal Ballet. We pay homage to her with a brief account of her career and a collection of some of Alexandra’s interesting quotes over the years. Alexandra was born in 1980 to parents of Italian and English descent. She is the youngest of three sisters and surprisingly, she arrived to ballet quite late in her life, having devoted her athletic body and energies to football at first. Her life changed when she attended an arts summer camp is Massachusetts and got told she should audition for the School of American Ballet (SAB). Aged 11, with no previous ballet background, Alexandra impressed the jury and was admitted at SAB. Commuting three days a week to New York from Long Island to attend class with older girls proved testing for Alexandra and she felt she was lagging behind. The following year, her parents had her move Secondary schools and rented an apartment in New York. During this time, Alexandra was already performing children’s roles with New York City Ballet (NYCB) and winning scholarships for very distinguished summer programmes. Even though she had never performed at annual performances, Peter Martins saw Alexandra in the studio and hired her as a NYCB apprentice. She then appeared in The Nutcracker and got rewarded with a contract and and a principal role (Dewdrop fairy) on her 16th birthday. She bolted across the ranks, soloist at 17 and principal at just 23, but this quick progression was not without its share of obstacles: she was off for almost two years with a misdiagnosed foot injury which left her unable to walk and close to the point of giving up dance. Her resilience and passion kept her looking for the right answer and finally after receiving the correct assistance she was given the all clear to return. Alexandra’s NYCB tenure gave her a huge fanbase and the opportunity to work closely with important choreographers, from the legendary Jerome Robbins to the young & budding Christopher Wheeldon, but she wanted to explore the big world of classics outside the local repertoire, so she decided to leave City ballet in 2005 to look for something else. This strategy paid off and in less than a month she was receiving offers from major companies with classical repertoire, amongst which an audition with Monica Mason followed by an invitation to join the Royal Ballet as a First Soloist, in other words, just the ticket for Alexandra to slowly break into those great classical and narrative roles she was aiming for. Even though she started as a First Soloist, Alexandra quickly saw principal roles coming her way. She danced The Lilac Fairy and Aurora in The Sleeping Beauty, Christopher Wheeldon’s Polyphonia, Balanchine’s Tchaikovsky’s Pas de Deux and Jerome Robbins’ Afternoon of the Faun. Some critics loved her (and we are forever indebted to FT’s Clement Crisp for first drawing our attention to her) but Covent Garden audiences were divided, given the stylistical differences the SAB training imprinted on her dancing. All this she took as a challenge, with a clear determination to conquer the dramatic undertones in the Royal Ballet’s own style. In March 2009, after a great season which began with plum debuts in Ashton’s Ondine and as Swan Lake’s Odette/Odile (“a performance of beautiful line, emotional finesse and of fascinating promise for the future” as Mr. Crisp then noted), Alexandra claimed ballet no longer completed her and announced her retirement. She had just wrapped up performances as Gamzatti in La Bayadere and the Sugar Plum Fairy in Sir Peter Wright’s Nutcracker, and had been lined up for Mayerling and Sleeping Beauty (amongst others) in the 2009/2010 season. Her last performance in London on June 16 as the lead female role in Balanchine’s Rubies opposite Carlos Acosta felt quite fitting, given her NYCB roots. Whilst she had throughout her Royal Ballet years expanded her range enormously, having drawn praise and a whole new fan base with her soft, rippling Ondine of just a few weeks before, Rubies never stopped fitting her like a glove: she dazzled and enchanted us, showing her fiery character and throwing herself into the choreography (It was quite a contrast to Yuhui Choe‘s more restrained, more studied performance in the same role). Alexandra’s last night at Covent Garden was a success, not only due to its aura of adieu, but because it was incredible to see someone clearly enjoying herself on stage and yet about to stop for good. She went out and gave it her all, with Carlos, who enjoys “upping his ante” when the occasion befalls, outstanding but giving Alexandra the opportunity to shine, since it was her night. At the end of Rubies, with a continuous flow of applause and some ruby red flowers thrown in from the amphitheatre, Carlos chivalrously led an emotional and teary eyed Alexandra to take centre stage, taking a back seat and directing the applause her way, letting Alexandra enjoy her moment all the way through the red run curtain calls. As the applause went on we felt as if some of the audience was trying to convey to Alexandra that she was loved and appreciated and that she certainly was going to be missed. It’s the music in the story ballets, the music, and then the story, that touches a part of my soul that is indescribable. I’ve always been passionate about the classical works, and it was important to me as a ballerina to get that education. I think he wanted his own style, different from the classical world that he had left behind in Europe. One of the things that fascinates me about ballet is to see how very different it ” looks ” from one country to the next. I would like the ballet to have a much broader audience, to reach far more people, and to have them understand more, and to be more involved, with our art form. I feel one must be completely devoted if you are a dancer, it’s like a marriage. I have had to face the realization that this is not completing me as a person. Alexandra’s last performances with the Royal Ballet are in Washington DC, at the Kennedy Center (June 24) and in Cuba, at the Gran Teatro de la Habana (July 14-16). She will be performing the lead role in Ashton’s A Month in the Country as part of the Royal Ballet’s triple bill. Balanchine‘s first full-length abstract ballet is a celebration of styles and his tribute to the tradition that had shaped ballet during the 19th and 20th centuries. One can only marvel at his achievement while admiring the complexity of the choreography, the richness of the steps and the inclusion of novelty movement and geometry between the dancers. Jewels is a crowd pleasing ballet that will always touch us in a particular way, even more if it is danced with complete command of both technique and artistry. The programme notes alert us to the natural associations one may draw between the ballet’s name and “a formal kaleidoscope”. When first approaching Jewels, it might seem that this is the case: the designs, costumes and music are all beautiful in every sense of the word, one can only stare in disbelief when the curtain opens to reveal the dancers in Emeralds. Never having seen it live before, I came to the opening performance with two missions: first to see how would I react to each different ballet and second to try to understand how Rubies became more popular on its own than Diamonds or Emeralds. On the first account, it surprised me to discover that although Balanchine is a master of the abstract, with a firm purpose to make us “see the music”, the possibilities of adding personal layers of interpretation to this ballet are endless. I found myself building a story for every single piece, creating characters out of the dancers’ portrayals (I wished I could query the dancers as to their particular ideas and stories when learning the choreography). I also realised, after a second view, that these “stories” changed with every cast, and depended on how they personally approached their roles, who they were partnering, the chemistry, how they presented themselves, physical proportions, etc. In some ways, an abstract ballet gives more interpretive freedom to the dancers while the audience has an opportunity to draw their own impressions from the proverbial “put a man and a woman together and you get a story”. The first night Emeralds brought us Tamara Rojo in the role that Violette Verdy made famous. She was partnered by Valeri Hristov replacing the “irreplaceable” (and sadly injured) Edward Watson, whom we missed deeply, since Tamara did not seem to have the same level of complicity with Valeri as she has with Edward. Tamara made use of her expressive arms and amazing acting ability to show us a young girl in love: smiley, flirty and sometimes shy, evading the looks of her suitor, running between the other Emerald ladies. Valeri was the man in love trying to conquer the object of his affection while Tamara tip-toed and twirled through her variation like a maiden who daydreams of her knight in a meadow full of flowers with a stream nearby, with added touches of butterflies and songbirds for good measure. All innocence and young love. Pure joy. Hristov’s variation was ably performed, though less eloquent in Romantic imagery: up to that point, it was all about Tamara. That is, until Leanne Benjamin appeared on stage. It is quite hard for anyone to steal Tamara’s thunder, but we feel that Leanne achieved this in the way she wove so much drama into the Emeralds “Walking pas de deux“. Here was a mature dancer on top of her game, giving us darkness after the sun, like an older woman saying to the world – here I am, I am still beautiful, still full of things to give, just look at me! – Piqué turns and grand battements made her vaporous tutu ethereal, and even though the movements were strong there was a sense of underlying sadness. This interpretation came full circle when a moody looking Bennet Gartside (replacing an injured Ivan Putrov) brought into the same pas de deux the feel of a mature married couple, struggling with the realisation that time is passing them by, that they are not what they used to be (suggested by the emphasis on arms and legs as clock hands). Registering every nuance of her interpretation I couldn’t stop wondering why Leanne is not as popular as some of the other Royal Ballet younger ballerinas. The Emeralds pas de trois was danced by the fantastic trio of Steven McRae, Deirdre Chapman (back from maternity leave) and Laura Morera, in what it looked to me like the “hot young guy” surrounded by two enamoured girls. Their execution was flawless and of course, Steven made ample use of this opportunity to show off his fantastic split jetés and perfect tours en l’air. The second cast of Emeralds had Roberta Marquez and Mara Galeazzi partnered by each of Valeri Hristov (in the same role as opening night) and David Makhateli. These interpretations were a complete constrast to Tamara and Leanne’s rich narratives, with Roberta a more straightforward Emerald who was just enjoying her dancing (and indeed, her smile was infectious). Personally I did not feel Emeralds was a good fit for Mara, since she didn’t convey the innate romanticism in the music and air. As the two leading men were not outstanding, I took the opportunity to observe here some of the girls who are starting to stand-out from the corps (and I wished the ROH included portraits of the artists and first artists in their programmes). The highlight of this performance was the pas de Trois, in which Helen Crawford and Samantha Raine shone, accompanied by an efficient José Martín. From left to right: Tamara Rojo, Leanne Benjamin, Steven McRae and Roberta Marquez. Source: ROH ©. Copyright belongs to its respective owners. In both performances, the finale was well executed and the members of the corps looked sharp and well-rehearsed, all the way to the final pose where the three men, in grand reverence, stare at the horizon. The Royal Ballet in Rubies. Photo: Johan Persson ©. Source: Voice of Dance. Next stop was sizzling, fun and jazzy Rubies, or should I rename it the A&A Show after the main duo of “Alexandra Ansanelli and Carlos Acosta“. For Alexandra owned the role. I wondered whether this was due to her long history with NYCB and Balanchine choreography, combined with the fact that she has been outstanding this season or simply that she is enjoying her very last performances before retirement from dance. She played and flirted with Carlos, swaying effortlessly, charmingly and elegantly through her steps. Carlos kept up the dialogue onstage and answered every single stroke, lest he be outshined by this leading lady. They were like the couple everyone stares at on the dance floor, nothing else seemed to matter for them. Here was an amazing newly discovered chemistry between them, which felt fresher than his own longstanding (and famous) partnership with Tamara. If only Alexandra and Carlos could have been paired up more often, they might have really complemented each other in various ways. Moving from pas de deux to solo, Carlos and Alexandra showcased their technical abilities while keeping up with the demanding pace, Carlos in particular relishing the opportunity to prove to the audience that he could soar through the stage at least as dazzlingly as Steven McRae from the previous section (plenty of grand jetés and ballon – daring to pause in the air -). Alexandra kept pushing the limits of the choreography, to the point of being in danger of falling. When a missing step called her bluff she just squealed and shrugged it off, which made the performance even more real and endearing. Less secure was Laura McCulloch in both Rubies casts, covering both Zenaida Yanowsky and Lauren Cuthbertson as the “Tall Girl”. She seemed eager to eat the stage but wobbled through a few of her arabesques and although much calmer (yet equally enthusiastic) on second performance, I ended up with the impression that she lacks some of the agility and speed to launch her ruby off the ground (though her extensions were amazing, particularly on the second night) and to keep up with the frantic pace of the corps. While I give Laura full marks for being able to pull a two-nighter on a main role at short notice & to stand her ground in a starry cast, I suspect her inner jewel is not really a ruby. From left to right: Alexandra Ansanelli, Carlos Acosta, Laura McCulloch and Ricardo Cervera. Source: ROH ©. Copyright belongs to its respective owners. The second cast of Rubies was led by Yuhui Choe (debuting) and Ricardo Cervera. They brought something different than the previous pair, acing the technical demands whilst looking like teenagers fooling around. The casting of Yuhui – a dancer with the softest arms, who looks in my opinion more Emeralds or Diamonds than Broadway – exemplifies the importance of giving dancers the opportunity to explore roles not immediately associated with them, to avoid “typecasting”. Important yes, but not necessarily always a good fit. Ricardo didn’t match Acosta’s performance but showed us again that he can jump like the best of them, and he definitely “popped out” when surrounded by the corps in the finale. With Rubies over, I finally understood its appeal and own success story. It is such an infectious audience-pleaser, filled with continuous surprises, twists and turns. The choreography is so strikingly different. While Emeralds is a thing of pure beauty, Rubies is the one people cheer for & laugh at. It is box office friendly, and its upbeat, full of spark atmosphere immediately grabs the occasional ballet goers’ attention and takes them along for a wild ride. The regal Diamonds, the last ballet of the evening, is full of Imperial Russian grandeur and nods to the classics (the hand in the hair from Raymonda, the balances on attitude from Sleeping Beauty‘s Rose Adagio, the arched back on retiré position from Act III Swan Lake, etc). The opening waltz for the corps de ballet immediately reminded me of Sleeping Beauty and Petipa in the beautiful classical lines displayed everywhere and its almost overwhelming grandeur. Still, this serves just as an aperitif to what follows next, the “grand pas de deux.” Opening night saw the beautiful Alina Cojocaru, continuing her comeback from injury, and Rupert Pennefather (who despite being quite tall has been dancing the lead role with tiny Alina since 2007, when he stood in at the premiere for an injured Federico Bonelli) looking picture perfect as prince and princess (again, think Aurora). This opening performance had quite a special “aura” that could be felt in the auditorium, as if we were all collectively gauging how Alina might have changed post her prolonged absence from the stage. She performed carefully and given the difference in height there were also slight complications and miniminal issues in Rupert’s partnering (as on the aided pirouettes). All this didn’t matter since it was more her artistry that shone through her dancing, her arms expressing every single note of the music, her face full of emotion, but with an underlying melodramatic tone that permeated the pas de deux. In some wonderful balances on attitude you could feel her full commitment to the steps, as if there was no tomorrow and this was the last time she could do this. It was not Aurora on stage, or any other of the Petipa heroines, but a more womanly princess, completely aware of her emotions and transparent to everyone to see. Suffice to say that her performance affected me in such a way that I still need some time to think about it. Alina Cojocaru and Rupert Pennefather in Diamonds. Photo: Tristram Kenton ©. Source: The Guardian. Rupert was a handsome prince and his dancing was sharp and precise, showing all the dividends he has accumulated this season as a dancer. His variation was elegant and noble. I thought he complimented Alina’s performance in a subdued way, and it was very sweet of him to thank her at the end, as if it had been his privilege to dance with her. He might not be my favourite partner for Alina, but he is definitely a dancer who is getting better and better. The second cast was led by sunny Marianela Nuñez and her real life prince Thiago Soares. Given the season Marianela has had, it would be difficult to think she wouldn’t ace this role, and indeed she did. As usual, her technique came across strongly and Thiago was more than an accommodating partner (his variation featured slightly different jumps than Rupert’s, but all cleanly executed). However, I couldn’t help feeling as if I was watching a reprisal of the Wedding festivities of Sleeping Beauty. There was not as much depth as in Alina’s and Rupert’s performance, but this might be just my personal take on it, as underneath it all, this is an abstract ballet. From left to right: Rupert Pennefather, Alina Cojocaru, Thiago Soares and Marianela Nuñez. Source: ROH ©. Copyright belongs to its respective owners. I should also add honorary mentions to the corps in the polonaise (although they offered a much better and coordinated performance on second night) and to Thomas Whitehead, Yohei Sasaki and Yuhui Choe on the first night, and Brian Maloney, Sergei Polunin, Helen Crawford and Samantha Raine (on double duty together with Emeralds), all of whom noticeably good in their soloist roles. In short, Diamonds stands as a great closing piece, one that evokes and pays tribute to the classics, while also serving as a rich frame to the central couple and in particular the main ballerina. It is the dance equivalent of a decadent dessert, a celebration of dance which is best enjoyed and appreciated alongside first courses of Emeralds and Rubies. In any case, the Royal Ballet did well to acquire the three ballets for its repertoire. It is the ideal vehicle for showcasing the jewel-like ballerinas in its ranks. I am quite sure I will be going back to Covent Garden anytime it is revived.